The new case from Fischer Elektronik will be a shell case in desk form with free selectable dimensions. 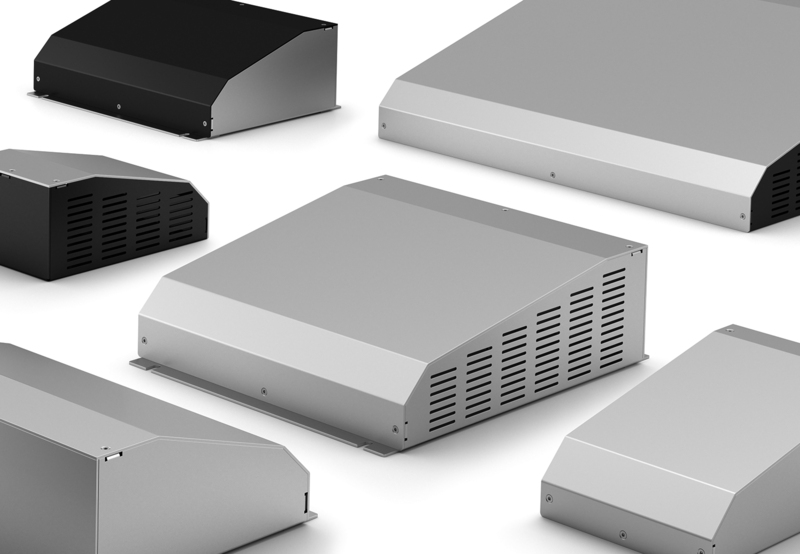 The case consisting of two bent aluminium shells with 2 mm material thickness allows a housing of PCBs of different seize – non-standard as well as standard PCBs can be mounted here. The PCBs are mounted by means of permanently integrated sockets which position and height as well as the dimension of the case is freely selectable. The easily performed mounting of the two case parts is done with help of a screw connection in the internal strap with press-fit connectors. In the new SGV desk console company Fischer Elektronik offers their customer the possibility to install PCBs with front mounting as well as with back mounting through the connectors which are accessible from the outside (D-Sub, USB, power plug). Due to the two angular surfaces a wide range of application possibilities is offered. The lower detached surface was selected in their dimension so that it offers space for switches or a logo. The bigger upper surface is excellently suitable for foil keypads or a display. Designs with ventilations slots allow an application with power electronics. Fixing straps allow a mounting to wall and ceiling so that numerous applications are realizable. All seize variants of the SGV desk console are available in three different surface designs as a standard (natural colour anodized, black anodized or transparent passivated). Additional mechanical processing, surface treatments and labels are realizable according to customer’s specifications.